Description: 9 piece flat blade screwdriver set in sizes 0.50mm through 2.0mm. Made in India. 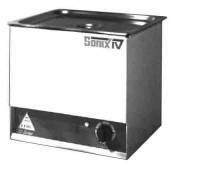 Description: Stainless steel basket for 6.4 quart size ultrasonic cleaner. Description: Nylon replacement for Part #13455 hammer. Combine with other replacement heads for price break. 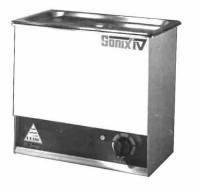 Description: Stainless steel basket for 11 quart size ultrasonic cleaner. 10-Piece Cutting Broach Set For Alarm Clocks .027" - .141"
Description: Economical 10 piece set of cutting broaches ranging in size from .027" to .141" In a plastic tube holder. Made in India. 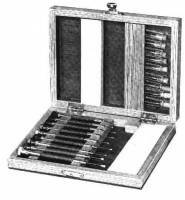 10-Piece Cutting Broach Set For Large Clocks .035" - .157"
Description: Economical 10 piece set of cutting broaches ranging in size from .035" to .157" In a plastic tube holder. Made in India. Description: Bergeon reamer is 7.47mm in size. Made in Switzerland. Combine with other sizes for price breaks. Description: Bergeon reamer is 8.47mm in size. Made in Switzerland. Combine with other sizes for price breaks. 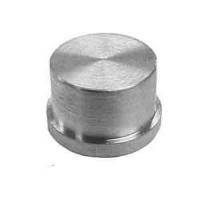 Description: 2-1/2" long BLACK assembly post attaches to clock plates during assembly. With offset head to hold clock plate securely. 3 or 4 posts are necessary for assembly. Description: Bergeon reamer is 1.20mm in size. Made in Switzerland. Combine with other sizes for price breaks. Description: Bergeon reamer is 1.97mm in size. Made in Switzerland. Combine with other sizes for price breaks. Description: Bergeon reamer is 2.47mm in size. Made in Switzerland. Combine with other sizes for price breaks. Description: Bergeon reamer is 2.97mm in size. Made in Switzerland. Combine with other sizes for price breaks. Description: Ollie Baker style mainspring winder handles springs of any size, both hole end and loop end. Includes nine steel mainspring sleeves, clamp and instructions. Requires letdown chucks available elsewhere in the catalog. Made in USA. Description: Bergeon reamer is 3.47mm in size. Made in Switzerland. Combine with other sizes for price breaks. Description: Bergeon reamer is 4.47mm in size. Made in Switzerland. Combine with other sizes for price breaks. Description: Bergeon reamer is 5.47mm in size. Made in Switzerland. Combine with other sizes for price breaks. Description: Bergeon reamer is 6.47mm in size. Made in Switzerland. Combine with other sizes for price breaks. Description: Metric high speed steel twist drill. Can combine with other sizes for price break. Size is 2.10mm (.0827").